This weighted fidget toy is a calming tool that can be used in the classroom or at home when kids need to calm down and focus to desk work. I love the fine motor benefits that kids get when making this calming fidget toy too. 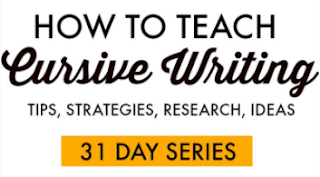 You'll use just a few materials to make this calming tool for boosting attention. The whole class or a group of kids can make them and use them to concentrate and focus in the classroom. 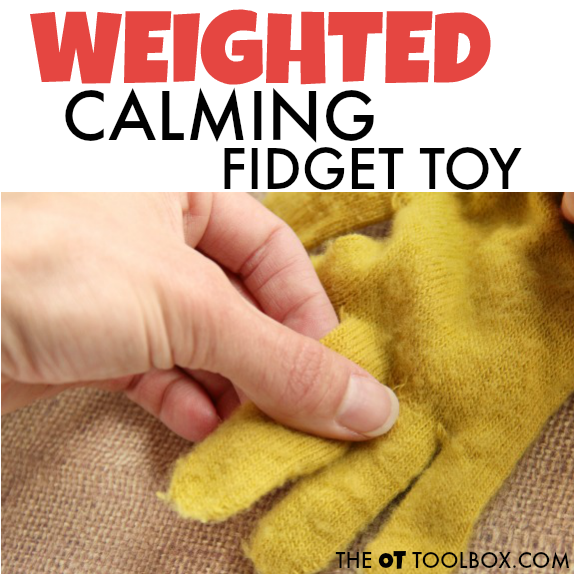 Use these materials to make a calming weighted fidget toy for helping kids attend and focus, with a calming weight. 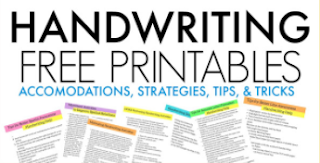 This is a great tool to use for kids who fidget during homework. I love that this attention tool is a DIY fidget toy option that would work in the classroom or in the home. 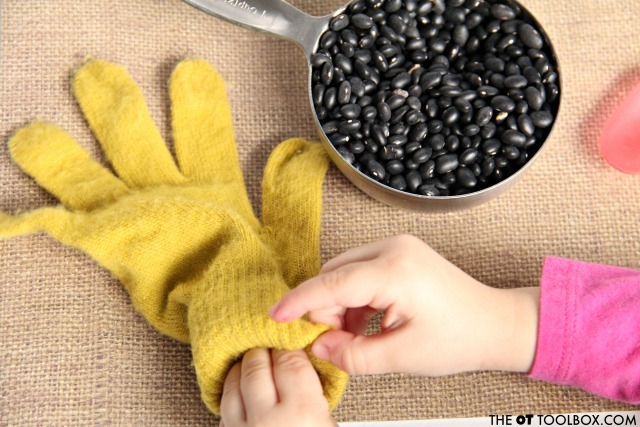 To make the weighted fidget toy, provide the kids with one cup of dry beans (or other material) and a single glove. This time of year, you can often times, find gloves on clearance. These are available in dollar stores as well. 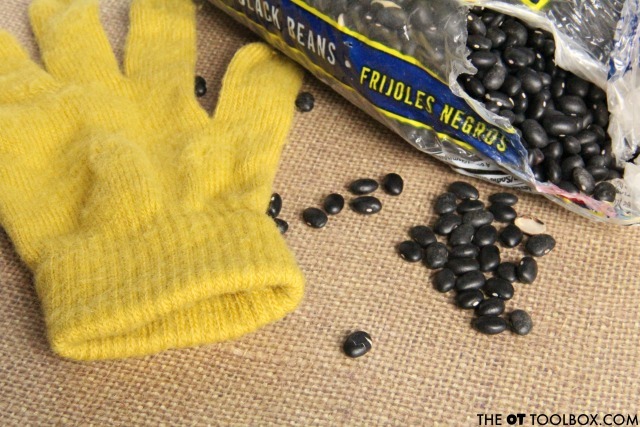 Show the children how to use a spoon to fill the glove with beans. 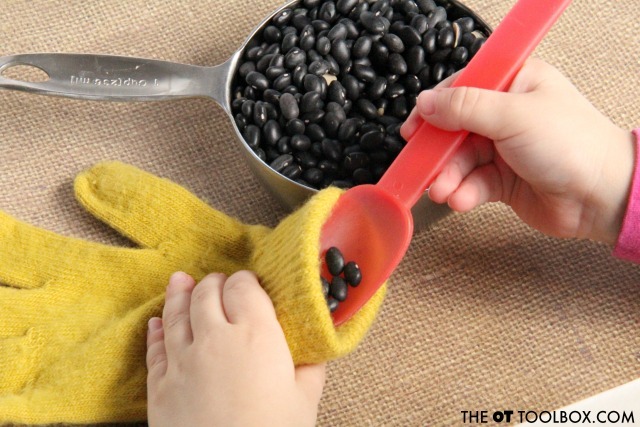 Scooping the beans into the glove is a great motor planning activity that encourages motor control, visual motor skills, and bilateral coordination. Then, sew up the opening of the glove. 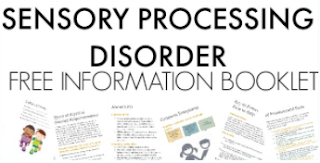 This can be a job of an adult or teen. And with that, your weighted fidget toy is complete. Use this tool on a knee under a desk to provide some heavy weight input through the calf. Kids can place it on one knee and then the next. Adding the weighted input through the knee provides proprioceptive input that is calming for some children. 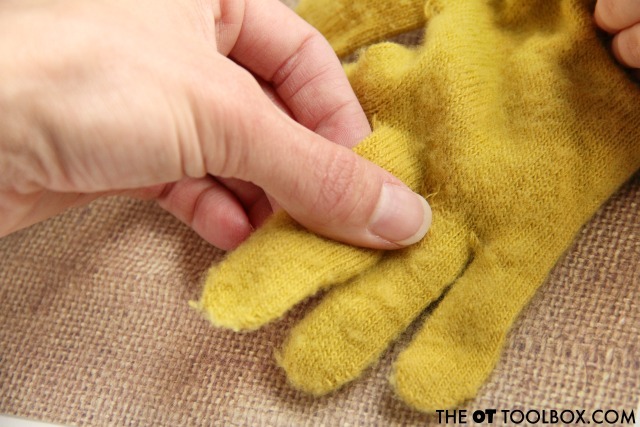 To use the weighted glove as a fidget toy, work the beans up and down the fingers of the glove. This is a calming and mesmerizing motor skill that is calming for some kids. 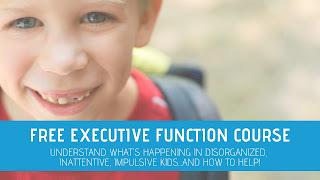 Combining the weighted input along with the fidget activity can be a powerful source of attention for children. Fidget toys are an excellent way to boost so many important skills during school or at home. Try this pencil topper fidget toy for use when writing. It might be nice to combine with the weighted fidget toy. Give this fidget toy a try! Let me know how it works for you! Looking for more easy fidget toys? These keychain fidgets are perfect for kids in school or on-the-go!